Federal documents are classified differently than traditional printed material. 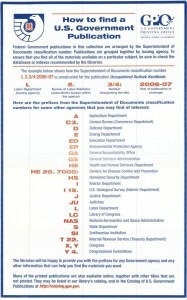 Instead of organizing content by the Library of Congress classification system or the Dewey Decimal system, federal documents are organized by the Superintendent of Documents Classification (SuDoc). The scheme was conceived in the 1890s by Adelaide R. Hasse, who organized U.S. Government publications principally on the origin of the document,its provenance (i.e. agency), rather than by subject. The classification system originated directly from GPO’s rapidly growing collection of government publications. 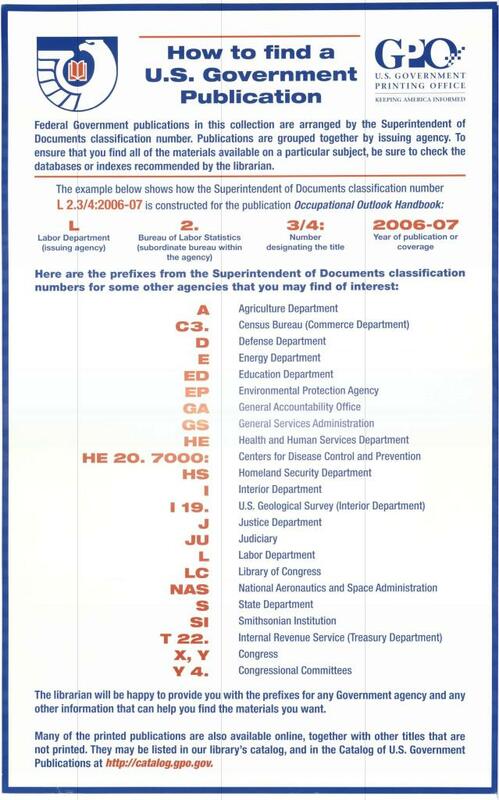 Each department in the Executive, Judicial, and Legislative Branches, and each independent agency, is assigned an alphabetic symbol, generally although not strictly, mnemonic; thus, A is Agriculture Department, C is Commerce, S is State Department. In later practice two- and three letter symbols have been used as necessary, so FS for Federal Security Agency (in the 1930s), HE for Health, Education, and Welfare, later transferred to Health and Human Services, NAS for NASA, and HS for Homeland Security. Congress and its committees and commissions are designated X and Y (source: FDLP). Michigan State University library created a wonderful research guide for learning SuDocs. The guide, which was designed for new librarians, includes SuDoc basics, a SuDoc quiz (I highly recommend giving it a try), and shelving exercises. If you are new to the world of fed docs, and want to better understand SuDocs, take some time to browse MSU’s guide.